While it has been highly entertaining to watch many of our favorite comic heroes come to life on the big screen these past few years, it is with animation that these characters will always have their truest life. There have been many successful adaptions of characters and mini-series over the years; Batman, Superman, Justice League, Teen Titans, The Avengers, Green Lantern, Planet Hulk, and now we have Thor: Tales of Asgard. This particular animated movie stars Thor but not as most fans know him. This time around we are treated to a teenage Thor starring a completely original story. The film opens with a young Thor (Matt Wolf) engaging in a practice battle with his father's guard. At this stage in his life Thor is your typical prince; brash, arrogant, proud, and conceited. After his sparring match he finds young Sif (Tara Strong) who has no problem pointing out to him what is obvious to everyone else, that his father's guards go easy on him and in turn do not allow him the benefit of learning from his mistakes. Refusing to believe a word of what she has to say Thor confronts his father, Odin (Chris Britton), and discovers that Odin has ordered his guard to take it easy on Thor when sparring. Thor insists that he is ready to take on any obstacle that comes his way and takes it upon himself to prove it. There is a legendary sword that many have gone searching for but no one has yet to find. Thor gathers his brother Loki and they stow away aboard the ship of the Warriors Three; three boastful young warriors who love searching for adventure and sharing their tales with any who will listen. They make their way to the home of the frost giants. According to legend it was here where Thor's father faced off against Surtur, the fire demon. When Odin finally defeated Surtur, the demon's sword was lost and any who are able to find it will possess the power of Surtur. Thor and Loki are able to deduce from the legend where the sword must have gone and sure enough, they uncover it. As Thor takes possession of it he is overwhelmed by the power it wields. The warriors make their way to the home of the Valkyries in hopes of gaining passage home, but on their way wind up incurring the wrath of the frost giants. As the warriors finally reach the Valkyrie's home and the frost giants prepare for war with Asgard, it is up to Thor and his friends to make haste or else witness the destruction of their world. Rather than go with big name actors for this film, the studio instead went with unknown actors, perhaps to give more credence to the story itself, considering it was an original. The animation is quite good, obviously done with traditional hand drawings there is no loss of quality here. The only drawback is the story itself; while it is good it isn't part of the Thor comic mythos and for new fans that are unfamiliar it may not make sense, especially with the live action film in theaters at the moment. Anyone expecting to see Thor wielding his legendary here will be sorely disappointed. 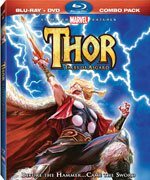 Now on Blu-ray and shot up with a worthy amount of extras fans of the film can sit back and smile as Thor makes his first steps towards becoming a man. On 2-discs, the first containing the Blu-ray version of the film, it also has a behind-the-scenes doc on the making of the film, a bonus episode of the new Avengers TV show, two different feature length audio commentary's, and a trailer gallery. Disc 2 features the standard version of the film and the same bonus features as disc 1. While Thor: Tales of Asgard is a fun film with lots of comic book action, it lacks the standards that most comic book fans would expect i.e. Thor's hammer, Loki at his most mischievous, the Warriors Three actually a force to be reckoned with and any noteworthy villain. This makes for a good film but unsatisfying at the same time. Download Thor: Tales of Asgard from the iTunes Store in Digial HD. For more information about Thor: Tales of Asgard visit the FlickDirect Movie Database.